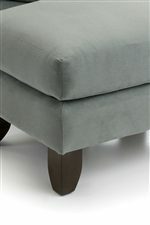 Provide your tired feet with a comfortable and stylish resting place with this ottoman. Featuring a plush cushion top and tapered legs, this ottoman offers comfort as well as a contemporary touch to update your home's decor. Use this ottoman with your chair or sofa in your living room and rest your feet while you visit with family and friends or watch the evening news. Enjoy the functionality of the ottoman in your home. The 919 Ottoman w/ Tapered Legs by Smith Brothers at Wayside Furniture in the Akron, Cleveland, Canton, Medina, Youngstown, Ohio area. Product availability may vary. Contact us for the most current availability on this product. Sleek and contemporary, the 919 collection can easily update and rejuvenate the look and feel of your home. This collection offers an upholstered chair and ottoman set that will solve your seating needs in your living room, family room, entertainment room or den. 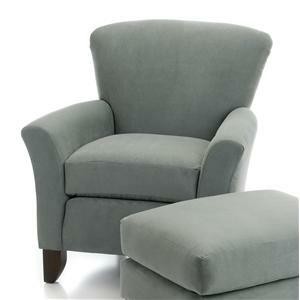 A wide flared back offers comfortable support for hours of reading or watching favorite shows. 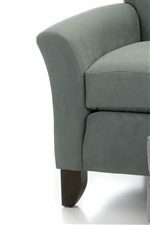 Flared arms also offer additional support while the tapered legs add a modern touch. Exposed wood are available in multiple finishes. This set is also available a in leather, so you can be sure that the 919 collection will fit your home's decor. Enhance your home with the contemporary style of the 919 collection today. The 919 collection is a great option if you are looking for Contemporary furniture in the Akron, Cleveland, Canton, Medina, Youngstown, Ohio area. Browse other items in the 919 collection from Wayside Furniture in the Akron, Cleveland, Canton, Medina, Youngstown, Ohio area.